A 1947 amateur film showed some 40,000 female Kemp's ridley turtles nesting in Mexico in a single day. Today, it is estimated that only about 1,000 breeding females exist worldwide. The Kemp’s ridley turtle is the world’s most endangered sea turtle, and with a worldwide female nesting population roughly estimated at just 1,000 individuals, its survival truly hangs in the balance. Their perilous situation is attributed primarily to the over-harvesting of their eggs during the last century. And though their nesting grounds are protected and many commercial fishing fleets now use turtle excluder devices in their nets, these turtles have not been able to rebound. 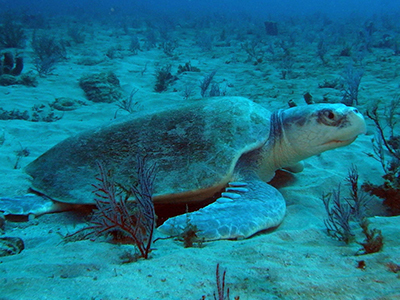 Found primarily in the Gulf of Mexico, but also as far north as Nova Scotia, Kemp’s ridleys are among the smallest sea turtles, reaching only about 2 feet (65 centimeters) in shell length and weighing up to 100 pounds (45 kilograms). Their upper shell, or carapace, is a greenish-grey color, and their bellies are off-white to yellowish. They prefer shallow waters, where they dive to the bottom to feed on crabs, which are their favorite food, and other shellfish. They also eat jellyfish, and occasionally munch on seaweed and sargassum. They may live to be 50 years old. Females aren’t sexually mature until about ten to twelve years of age. They nest every one to three years and may lay several clutches of eggs each season. Highly migratory animals, they often travel hundreds of miles (kilometers) to reach their nesting beach, usually the same beach they hatched from.